410 mm/50 10th Year Type3 х 3 pcs. Initial HE Shell Velocity869 m./s. 155 mm/60 3rd Year Type3 х 3 pcs. Initial HE Shell Velocity925 m./s. 127 mm/40 Type89 A1 mod. 26 х 2 pcs. 25 mm/60 Type96 Triple mod. 110 х 3 pcs. 155 mm/60 3rd Year Type1 х 3 pcs. 127 mm/40 Type89 A1 mod. 212 х 2 pcs. 25 mm/60 Type96 Triple mod. 128 х 3 pcs. 25 mm/60 Type96 mod. 124 х 1 pcs. One of the draft designs for a "super battleship" concept, preceding the appearance of the Yamato-class battleships. This design featured heavy armor and a sufficiently high speed complemented by powerful main battery guns that were unconventionally placed in three turrets located at the ship's front end. Once considered by many to be among the worst Tier IX ships in the game, Izumo has seen a variety of improvements since the launch of World of Warships. While her stock hull still has mediocre secondaries, a weak anti-aircraft battery, and bad turning characteristics, the AP shell penetration of Hull (A) has been significantly improved, allowing her guns (at least) to remain competitive against the likes of Iowa and Friedrich der Große beyond 15km. The central weather deck was increased to 57mm to mitigate damage from high explosive shells from 203mm and IFHE 152mm guns. The concealment, once among the worst of any ship in the game, has been considerably improved, though still on the lower end of the spectrum for Tier IX battleships. Izumo’s armor on her sharply-angled bow can deflect most AP shells fired at the hull, save for Yamato and Musashi which can overmatch 32mm bow plating. Once Hull (B) is unlocked, she gains somewhat better secondaries and AA. While the middle weather deck was buffed, she remains vulnerable to full penetration damage from high explosive shells in upper belt, bow, and stern and the fully upgraded AA suite is not adequate enough to fend off air attacks, even with support from allies. Pointing her bow at enemies and reversing at mid range — similar to how many captains play Dunkerque, Iowa, and North Carolina — is a valid tactic in Izumo, and is quite effective against enemy AP rounds. Like all high tier battleships, she remains vulnerable to fire. Good range on secondary battery. Main battery gun penetration is excellent, with very high shell velocity for a battleship. Decent hull armor along the front half of the ship. Good belt armor, with thick turtleback giving good protection even at moderate angles. Small superstructure means that incoming shells don't have a whole lot to hit, 57mm weather deck over the middle shatters all cruiser high explosive shells. Izumo is a large target (larger than Yamato!). Has one less gun barrel, lower damage per minute potential, and inferior accuracy than the preceding Amagi, even when upgraded. In many respects, Izumo is inferior to Amagi - including size, speed, torpedo protection, and maneuverability. Second turret's tall barbette makes the turret vulnerable to getting knocked out. The middle turret does not have full 360 degree rotation, even though it seems possible. Turtleback angle is not as ideal as her German counterparts, so showing full broadside will make the citadel vulnerable. Turret placement leaves ship extremely vulnerable to attacks in aft arc and makes the No. 3 turret very difficult to use. Secondaries only fire to the side and rear, making them nearly useless in the typical play style of the ship. Though buffed, concealment is still mediocre, with only the Friedrich der Große being worse. Unlocking and investing in both hull upgrades will greatly improve Izumo’s handling and performance. With those out of the way, either of the remaining modules can be improved in whichever order suits individual captains as they are relatively minor buffs. Slot 1 provides players with the first option in choosing a desired role. Typically, Main Armaments Modification 1 is recommended to provide additional survivability to the main battery, but players who desire to specialize in the secondary or anti-aircraft armament should choose Auxiliary Armaments Modification 1 ( ). Slot 3 allows for further specialization. Generally, Aiming Systems Modification 1 is recommended because it reduces shell dispersion of the main and secondary armaments. To increase the effectiveness of the anti-aircraft armament, mount AA Guns Modification 1 ( ). Players wishing to specialize for secondaries should mount Secondary Battery Modification 2 ( ). Slot 6 gives players options to finalize their build. For gunnery, mount Main Battery Modification 3 to decrease the reload time of the main battery. AA Guns Modification 2 ( ) should be mounted for AA duties to increase the DPS of AA guns. Players wishing to increase the effectiveness of the secondaries should mount Secondary Battery Modification 3 ( ). Players can equip the following consumables on Izumo: ​Damage Control Party, Repair Party, and a choice between Spotting Aircraft and Catapult Fighter. It is strongly recommended to take the Premium versions of ​Damage Control Party and Repair Party to maximize survivability. 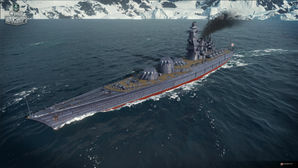 Players who wish to spend doubloons can equip Izumo with Type 19 camouflage that lowers her detection radius, reduces the accuracy of incoming shells, reduces her repair costs, increases her credit earnings, and increases the amount of experience she earns. As with all battleships, Izumo comes with 8 signal flag slots. The three most important flags are India Delta, Juliet Yankee Bissotwo and India Yankee; all of which will improve your surviveability. If the captain goes with the Secondary Build, the addition of Mike Yankee Soxisix will further improve the performance of Izumo’s secondaries. Izumo (出雲 "Outward Cloud" named for the Izumo province) in game was the A-140-J2, one of the alternate design proposals in the project that would result in the famous Yamato-class. In 1936, after Japan had left the League of Nations and renounced the Washington Naval Treaty, the Imperial Japanese Navy contacted leading naval engineer Yuzuru Hiraga to design a new battleship not bound by treaty limits. Hiraga drew experience from designing the Yubari, Fubuki, and Mogami classes to help him design the new battleship, designated A-140. In all, 24 preliminary designs were submitted to Naval Command for review, with varying turret configurations and endurance. The A-140-J series designs were notable in that they were the only ones to mount 41 cm guns, as opposed to the "Type 94" guns that were in reality 46 cm caliber; the design of these ships were more mindful of the existing docks and slipways in Japan at the time. The A-140-J2 has a turret configuration similar to the HMS Nelson and had a hybrid engine concept. However, due to advancements in fire-control methods and the failures of hybrid-engines in the submarine tender Taigei and the seaplane tender Mizuho, the plans were scrapped in favor of Hiraga’s 18-inch armed conventional layout, which would later become Yamato. The design, known as A-140-J2, was never built and therefore never named; the in-game name was given to the ship by Wargaming in accordance with the Imperial Japanese tradition to name battleships after provinces of Japan. There have been two real Izumos: the IJN Izumo was an armored cruiser built at the end of the 19th century that served in the Imperial Japanese Navy until 1945 and the JS Izumo which is a helicopter destroyer currently in the service of the Japan Maritime Self-Defense Force. Actual name is A-140-J2. The real Izumo was an armored cruiser that was still in IJN service during World War II, serving until July 1945. As such it is extremely unlikely that A-140-J2 would have also been named Izumo. As A-140-J2 was merely a preliminary design, both hull upgrades are fictitious WW2 refits. Planned horsepower was always 135,000 hp. The 132,000 hp downgrade is fictitious. The triple mount version of the 25 mm/60 Type 96 anti-aircraft gun entered service in 1941; A-140-J2 was designed in 1935. The 24 different preliminary designs for the Yamato. Blueprints of the triple turret. This page was last modified on 9 February 2019, at 21:43. This page has been accessed 97,809 times.